With a new highly anticipated and talked about mascara recently launched from Benefit, I thought I’d give my They’re Real mascara a good go before deciding whether or not to venture into a new eye product from the same brand. My tube of this mascara is a pretty petite one, a recent claim of Sephora VIB points to add the tester to my tab. So I thought, since it’s little, it’d be a great travel companion; so I took it to Mexico. Oh, and how I wish I’d packed my other mascaras as well. I don’t really enjoy using the word ‘hate’ when it comes to describing a beauty product, but this one certainly borders on my acceptance to the word. My dislike of the product starts with the wand. The applicator wand looks to be a normal, good quality wand, but upon application I realized that each little bristle of the wand was like a sharp, pointy spike ready to do some serious damage. I realize that many people like strong wand bristles to really catch onto the lashes and apply a thick layer of mascara, but I prefer fuller, softer bristles to catch each lash. The formula of the mascara itself is also not my favourite. The mascara looks great once applied, yet I’m not always willing to deal with such difficult aftermath. The mascara really sticks and could not be removed using my everyday eye-makeup remover. The next morning I’d have massive raccoon eyes as the remainder of the mascara was dragged across my sleepy face. Like I said, the mascara looked great once applied. 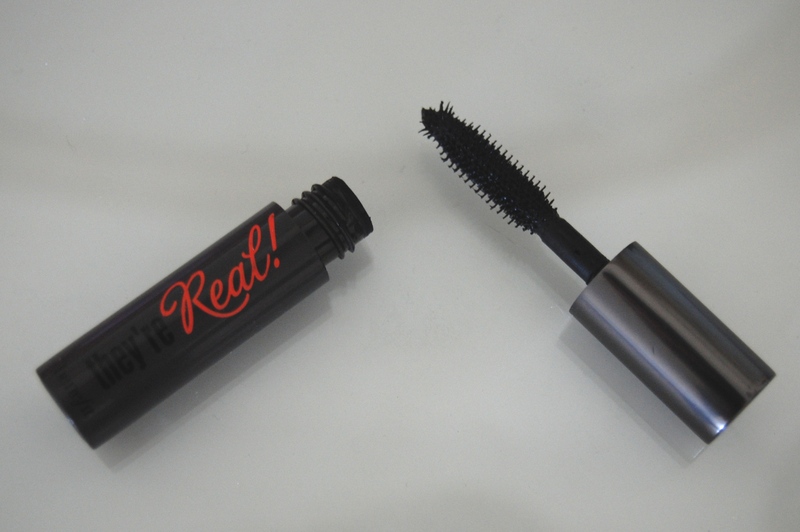 I can see why They’re Real has become the favourite go-to mascara for so many people. But, personally, I’m not willing to have to work so hard upon application and removal for an every-day mascara. I do believe I’ll be sticking to my L’Oreal favourites, although I’m always willing to give the new Roller Lash a go. Have you ever tried Benefit’s They’re Real Mascara? What were your thoughts? I use They’re Real but I find it a little clumpy, and to even it out I end up putting several layer on before it looks any good. I’m looking to try something smoother, do you have recommendations? I really love L’Oreal Mascara’s. Either the Miss Manga or the Million Lashes Excess. I am not the biggest fan of this mascara either! I feel like it doesn’t so much for my straight lashes. I am not sure where all of the hype came from since it’s an okay product in my opinion. I’m sorry you didn’t bring any other mascara’s on your trip, that would have bothered me. Great review! i am glad that I came across this because I had wanted to try it but now not so much. I use the Tarte, ready, set, lashes and the urban decay. but mostly I use L’Oreal or Rimmel London. and those are really great.